Squalene is unique oil high in Vitamins A and D that is found in high concentrations within shark liver. It also occurs naturally within the human body where it supports natural lubrication for our skin and supports oxygen delivery and toxin removal within all our body's cells. Pure New Zealand squalene is ideal to take daily to naturally support beautiful skin, eye health and overall well-being. 99.9% Squalene and 0.1% Natural Vitamin E. No artificial flavorings, preservatives, sugar, salt, corn, yeast, gluten lactose added. There is a worldwide shortage of squalene currently and the price has risen significantly as a consequence. Squalene is a poly-unsaturated hydrocarbon liquid (C30 H50) which occurs naturally, ubiquitously in human tissue in small amounts. The most abundant source of squalene is from the livers of deep sea sharks to be found at depths of as much as 1,500 metres. It occurs in Shark liver oils as the major component, comprising up to 85% of the oil. Squalene is not found in sharks living at shallow sea levels. The non-saturated hydrocarbon C30H50, in order to stabilize, attaches hydrogen ions from water and acids in the body, and in the process, frees oxygen to the body. It was established that the non-mythical Squalene stimulates the metabolism of the body by supplying an abundance of oxygen to the tissues. Several type of sharks live 3,000 feet under the sea. At this depth, sunlight and oxygen are almost nil. The Atmospheric pressure is intense and conditions are harsh. The ability of these sharks to survive under a hostile environment is due largely to the size and content of their liver which contains pure Squalene. It is Squalene which supplies much of the volume of oxygen needed in their bodies, providing strength and stamina. Squalene is non-toxic, 100% natural and has no side effects. Its beneficial action is not limited to a particular organ. If any, initial reactions result from toxins being released from the body. Squalene revitalizes weakened body cells and helps revive cell generation. Its chief attribute is the protection it affords cells from oxidation reactions. The human body has about 6 billion oxygen reliant cells. Oxygenation promotes good health to the most basic level of life - the cell. Squalene helps clean, purify, and detoxify the blood from toxins, facilitating blood circulation. It cleanses the gastrointestinal tract and kidneys, causing better bowel movement and urination. Many diseases are cured if the blood is purified, a condition Squalene contributes to. Squalene is good cholesterol that is made up of high density lipid (HDL) which prevents the hardening of blood vessels and deposition of cholesterol plaques. To test the authenticity of pure Squalene, you can place the deep-sea shark liver oil extract in the freezer. Even at low temperatures, it should not freeze, allowing the substance to flow freely into your system, pumping oxygen into the cells. Since Squalene prevents cell damage, beautiful, healthy cells are produced. Linked together with lipoproteins, it later forms lipofuscin, an anti-aging substance. It also prevents the formation of harmful lipid peroxide which destroys various kinds of vitamins. Squalene carries oxygen in the cellular level, causing further improvement in organ function through cellular metabolism, preventing the acidotic cell syndrome where cells become acidic, deteriorate and die due to lack of oxygen. There is a significant relationship between the degree of one's health and the amount of oxygen consumption by body cells. In today's polluted environment, lack of exercise, and poor lifestyle, Squalene gives your body a beneficial source of oxygen. Squalene's terpene gives a sterilizing effect, combating the growth of various germs such as coliform bacilli, dysentery bacilli, micrococcus pyocynanel, staphylococcus, hemolytic streptococcus, and candida albicans. 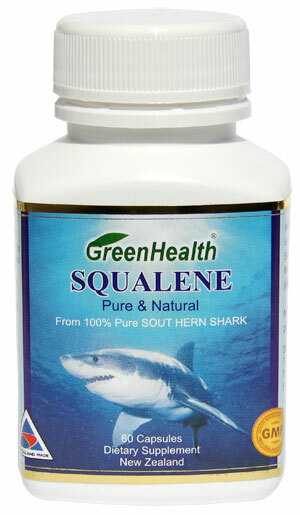 Squalene naturally increases male potency and vitality through a better body. It also helps regulate the female menstrual cycle and improves irregular and abnormal cycles. Squalene - reduces various aches and pains - helps body organs such as the kidneys, liver and gallbladder function properly - helps digestive system function properly by reducing gas troptosis conditions, helping to shrink hemorrhoids and curbing obesity - Acts as a relaxant, giving added vigor and vitality without the hyper-activity associated with other food supplements - generates hair and smoothens skin - exhibits a penetrating action with immediate effects on topical applications - helps prevent various kinds of diseases and speeds up the healing process in most conditions of ill health.